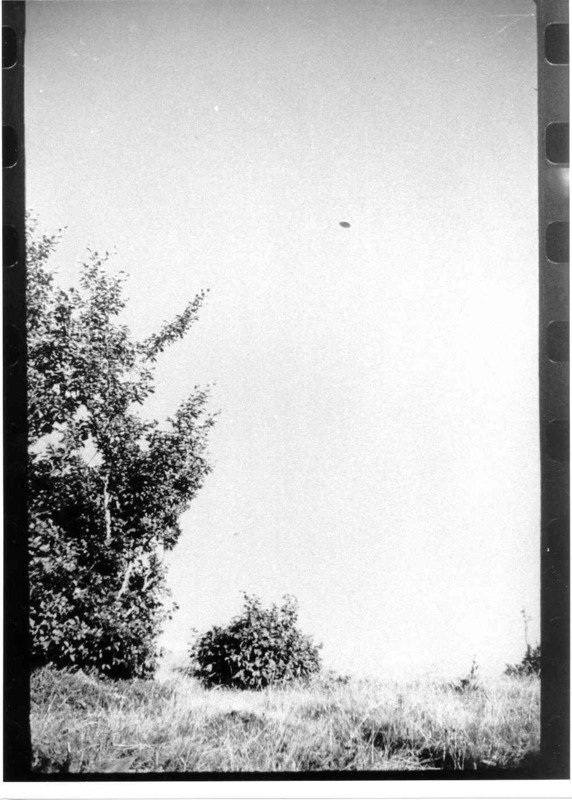 Very interesting photographic ufo case from France 1952. The information posted in this thread is for Educational study purposes. Summary: Andre Fregnale, an engineer and photographer, walked around France's Lake Chauvet on July 18, 1952, for a great many hours taking pictures of a UFO that came out of the Northwest sky. The sky was clear and luminous and the UFO moved in the heavens at an altitude of 1,000 meters for several hours. The film was developed and analyzed by Pierre Guerin, a well respected astronomer and confirmed the UFO object as real. 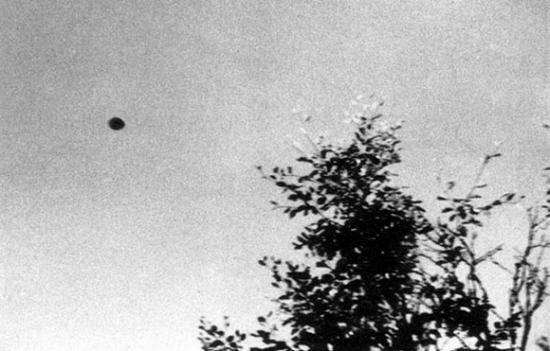 The photographs have been scrutinized by many experts and all have found them to be real shots of a real UFO. Mr Fregnale, Auvergne, Lac Chauvet, France 1952 UFO Photos (2 of a total of 4) analyzed by GEPAN -later SEPRA- (official UFO study project in France) and considered genuine. LAC CHAUVET, France 1952: Mr. Fregnale electrical engineer of Le Puy, was hiking in the area of Bessem Friday in search for geological study, near Lake Chauvet, when he saw a kind of disc that crossed the sky from West to East. He took 4 photos. "I had the time to take four shots very quickly. I saw the machine approximately during 50 seconds and after having taken the photographs I observed the craft with binoculars. According to my observations and calculations I made afterwards, if the saucer were at 3.000 meters it was going at approximately 300 meters per second. If it were at 8.000 meters its speed was larger obvioulsy and could reach 800 meters per second. I heard absolutely no noise. The Off Center Spot: Here certainly is a detail impossible to invent, at least by witnesses who have never heard of it. How could a number of people independently invent something apparently so meaningless a less-luminous spot moving about on a saucer at each "turn of the rudder"? The spot in question can be seen quite clearly on the photograph taken by M. Fregnale at Lake Chauvet. And we can predict that in photographs of saucers one part of the object will be underexposed if the exposure is adjusted to its average luminosity: there will always be a dark shadow in the vicinity of the center [Michel, 1957]. The Witness Account and the Photographs - Date : July 18th, 1952.
of 3000 m, toward west at ground level (speed: 60kmlh) (from the French Metiorologie Nationale). Sun position : altitude 22", azimuth 97" west. Trajectory of the object: from west to east (from right to left for the witness facing the south). The object had been noticed coming from the right just before reaching its largest angular height to the south. The witness immediately took two photographs when the object was near this largest angular height (Photographs I and 2), and then took two other photographs when the object was moving away to the left, going down towards the horizon due to the perspective effect (Photographs 3 and 4). As the object's angular dimensions became smaller and smaller, the witness used his binoculars to view it and, shortly after, saw it disappear mysteriously, as if it had vanished on the spot. The observation only lasted about fifty seconds, and the witness thought that the object's azimuth covered about 100 degrees during this time. The trajectory was "horizontal and straight," the linear speed was apparently "constant," the movement uniformity was "impressive, without any swinging or sinuosity in the trajectory," and there was a "total" silence. Description of the disk: a circular object seen obliquely from beneath (ellipse), "without any protrusion: no antenna, neither porthole nor propeller (sic), no presence of smoke or hot gas." The visible side (lower side) was dark, "with an undefined color, metallic gray or gray-green." A darker oblong and eccentric spot was visible under the disk, like (under the hypothesis of a driven machine) a slightly swollen "nacelle" or "cockpit." The witness saw, with his binoculars, a "cut" in front of this "cockpit," and another one at its rear. The photographs: according to the witness, 25 seconds were taken to shoot the photographs, with about 8 seconds between consecutive shots. (One can suppose that this time interval should have been shorter for the two first shots than for the last two, since the object's angular speed decreased with distance under the hypothesis of a constant linear speed.) The film: Kodak Panatomic-X 35 mm. The developer type: modified Kodak D-25 (with genol-sulfite boric acid). The bath was old, so the development was prolonged. The camera: Zeiss Ikonta with an excellent Tessar lens (with a 45 mm focal distance) and with a central shutter of Compur or Prontor type. A slightly yellow filter Wratten 15 was used (to darken blue sky on black and white photographs). The diaphragm was likely set at 1 :5.6. The displayed exposure time was 11250 s (but likely 1/200 s, since central shutters are always too "slow" at high shutter speeds). Considering the average photographic density which varied on the negatives, the diaphragm (or the speed?) was changed between the first and second shots. The four images, taken successively, are numbered 3-3a, 4-4a, 5-5a and 6-6a on the film margins. We shall label them 1, 2, 3 and 4, respectively. 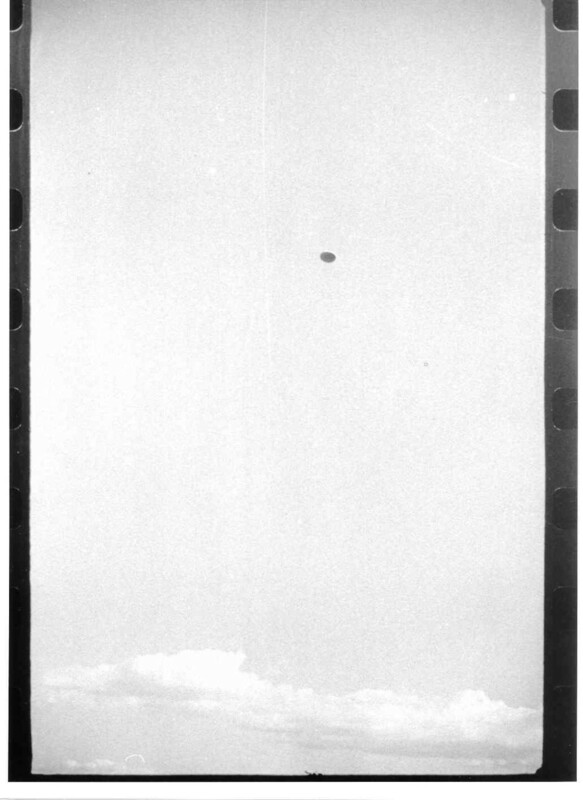 Images 1 and 2 were taken with the camera raised towards the sky and held "horizontally," images 3 and 4(which show clouds near the horizon and a little grassy hillock in the foreground, respectively) with the camera held "vertically." On each image the oblong black spot under the object is clearly visible, but it does not resemble a "cockpit," even a flattened 0ne. On the other hand, no slit is visible, either in front of or at the rear of the spot. The shape of this structure is identical on the four photographs and obeys the laws of perspective. This contradicts an interpretation involving a shadow cast by something under the object. Moreover, the lower side of the disk cannot be illuminated by sunlight, because of its slight inclination towards the north (see below) and of the altitude of the sun above the western horizon. For these reasons, the oblong black spot under the disk appears to be a permanent structure located on its surface. In addition, we can clearly observe a shiny edge which is on the upper and right part of the disk. This apparently results from the reflection of sunlight on the side of the object, considering the alleged position of the sun with respect to the images. 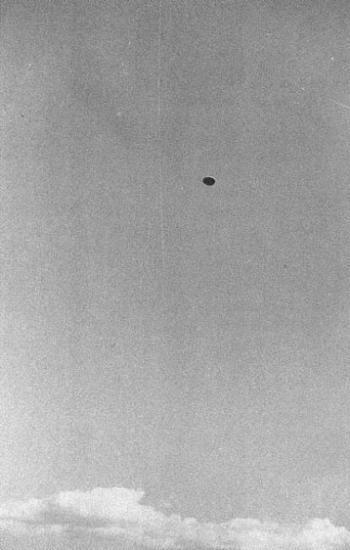 Like many other early ufologists, I discovered the Lac Chauvet UFO photographs in Aim6 Michel's first book, "Lueurs Sur les Soucoupes Volantes" (published by Mame), which I bought in August 1954 when it was published.' These photographs had been taken two years before by an engineer named Andre Fregnale. Two of them were included in the book with a short comment, in fact incorrect, relative to the order of the shots and to the direction of the object's movement. These photographs displayed a disk viewed obliquely like an ellipse flattening with distance, in a very clear summer sky. The horizon was not visible on these images, but it was obviously very near to the lower limit of the photographed field. Stratified cumulus in the background, such as one can observe near the horizon, appeared at the bottom of one image; a little grassy hillock was visible in the foreground of another one. These details permitted a first evaluation of the object's angular height, provided the focal distance of the lens was known. 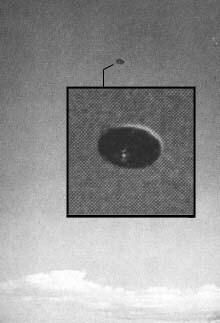 The lower part of the UFO was dark, and no detail was visible on the published images. The upper right edge of the ellipse looked bright, as if sunlight had been reflected by the object. 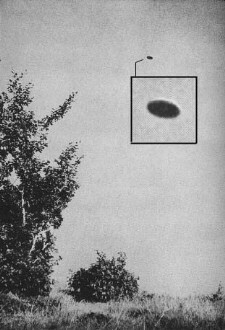 These photographs were interesting to me because of their clarity and of the qualifications of the witness, who had very precisely observed the object and did not believe in flying saucers. At the end of his observation, as the object flew away towards the horizon, Frkgnale, who had taken his binoculars, saw it "disintegrate" and disappear on the spot. For that reason, he assumed that it was "agglomerated cosmic dusts" (which is complete nonsense for any astronomer or meteorologist). Some years later, I obtained the original negatives. There were actually four 24 X 36 images, taken successively on a black and white negative film. They were preceded and followed by images having no relation with the UFO photographs. Therefore, there were no successive attempts to get "good" photographs of the object, nor "failures." For me this was a strong argument 'This book has been published in America under the title "The truth about flying saucers." It seems FrCgnale did not want his photographs published without copyright. Thus, he had left copies of them to an agency which was in charge of distributing them. The standard of living of retired engineers during years just after the Liberation was not as it is now, so I think FrCgnale's behavior does not argue against the authenticity of the photographs. negatives with a microscope, which made me certain of the absence of any alteration or natural photographic artifact like a reflection, development marks, etc. These were images of an outside object formed on the film through the camera lens. 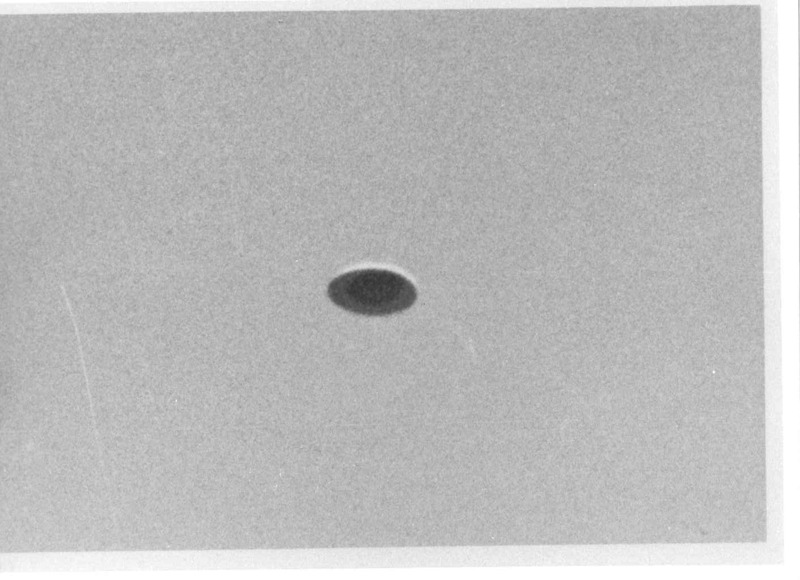 Moreover, these images could not result from intentional superposition (by use of a two-way mirror or other means), because such a trick would not leave on the negatives dark details of the foreground trees completely underexposed and the lower side of the UFO partially underexposed. 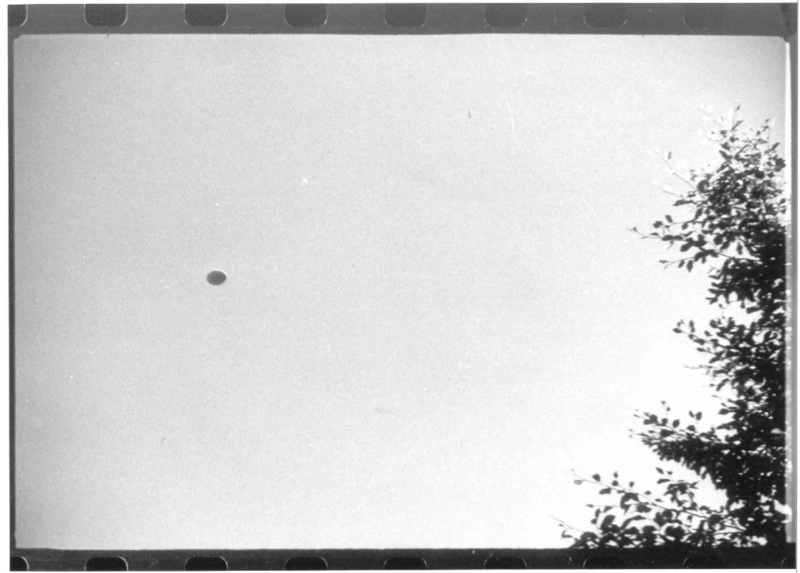 Hence, the photographs actually showed an object in the sky, but what kind of an object ? In 1972 I used these images to illustrate a paper on UFOs, which was published the same year in the September issue of the French magazine Science et Avenir. 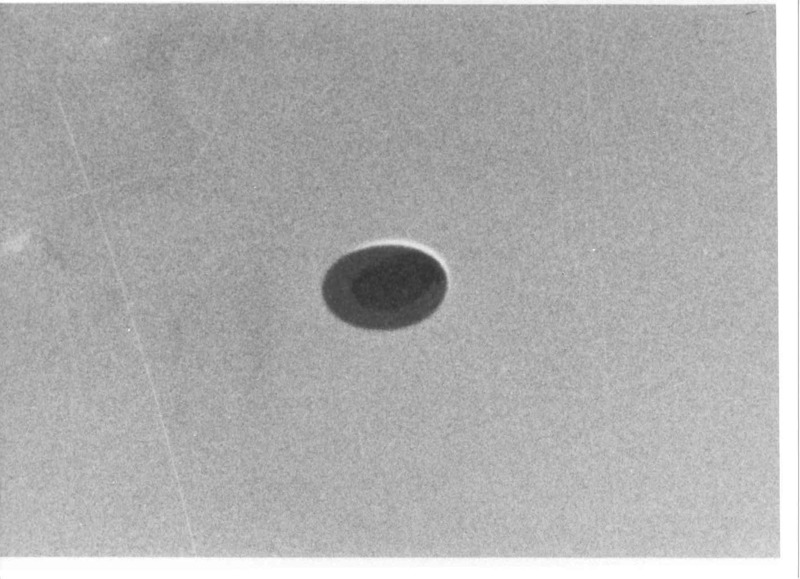 At that time I drew the reader's attention to the presence of an oblong black spot on the lower dark side of the disk. At first glance, this spot seemed pointed in a direction opposite to the alleged movement of the object on the four images, changing progressively with the perspective effect from a horizontal position to an inclined one towards the top right, as the object "went down" towards the horizon at the left. But it is only recently, at Joel Mesnard's suggestion, that I undertook to mathematically test this apparent property. Study of the images convinced me that a detailed analysis would reveal much more information than a brief examination could. One then only has to compare the numeric data obtained from the images to a geometric model of the trajectory based on the witness's statements. The deductions drawn from this modeling appeared to be predictive, in agreement with the computations made from the measurements done on the shots. 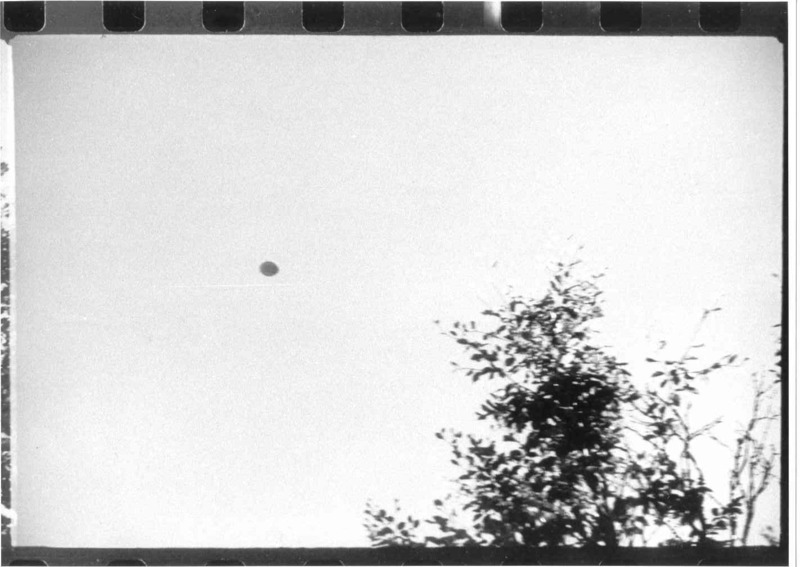 This procedure has provided the proof of the authenticity of the photographs; the UFO geometrically behaves like a distant flying object traveling on a straight horizontal trajectory, always keeping some inclination to the ground, and not like a model oscillating at the end of a wire or thrown into the air four consecutive times. 0nce this work was finished, I returned the original negative roll of film to the person who had lent it to me and who then gave it back to FrCgnale. Recently, I learned that the roll of film stayed in his hands until he died about ten years ago. FrCgnale was single and lived with his sister who was single also. I was able to get the present address of this woman, who is now very old. It seems she still has the material left by her late brother, but says she is too tired to search for them in the box where they have been placed. The original negatives of the Lac Chauvet UFO will probably be thrown away when the old woman dies, even if heirs are defined. So I had to be content with working on my copies of these negatives, which on my honor as a scientist, have not been altered. 'A French ufologist, editor of the French journal of ufology Lumikres dans la Nuit.